Crone Chronicles #39(original) Mystery & Mastery [cc39] - $6.95 : BBI Media - Magazines that feed your soul. "As a Crone, I have earned the right not to sweat the small stuff and to recognize the insignificant when I see or hear it. As a Crone, I have earned the right to forage through the ages for inspiration and set my own standards." Thus speaks Gert Beadle, who shares her experience of becoming a (self-named) rebellious woman at the age of sixty in her essay "An Untamed Spirit of the Wild." That spirit — maturing into risk and self-exploration — describes the theme of this issue well. 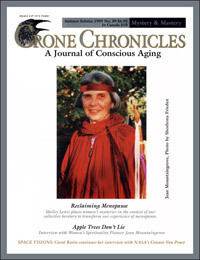 Crone Chronicles was no stranger to controversy, and Carol Rosin's guest editorial "If I Can Do It, We Can Do It" ignited a firestorm with her essay describing her transformation through body-building, which she explicitly connects to the necessary transformation of society away from a culture of war. Many applauded her audacity (she transformed herself, in part, by entering a body-building contest), while others felt judged by her decision to tie her (self-named) depressed, fat, out-of-shape body to the war economy. Read her startling essay and decide for yourself! On a more relaxed (if more intellectually complex) note is Ann Kreilkamp's editorial "Beyond Saturn," linking Crone consciousness and astrology. As both the founder and editor of Crone Chronicles and a professional astrologer, Ann uses this opportunity to explore the ways in which the discipline of astrology connects with her understanding of the emerging Crone movement. Looking for a croning ritual for yourself or a friend? Holley Humphrey's "Answering the Call of the Crone" describes a lovely Summer Solstice croning as well as her awakening journey to crone consciousness during her second Saturn return and Carol Rosin's talk with NASA's Connie Van Praet (which continues an interview she started in issue 38) probes the continuing controversy of the militarization of space. Short articles on topics as varied as crows as symbols of crone, welcoming the trickster goddess Baubo and the blood mysteries of menarche, menstruation and menopause round out this rich and varied issue. 84 pages, edited and published by Ann Kreilkamp in Summer of 1999.